For there I took the last farewell, of my sweet Highland Mary. For dear to me as light and life, was my sweet Highland Mary. 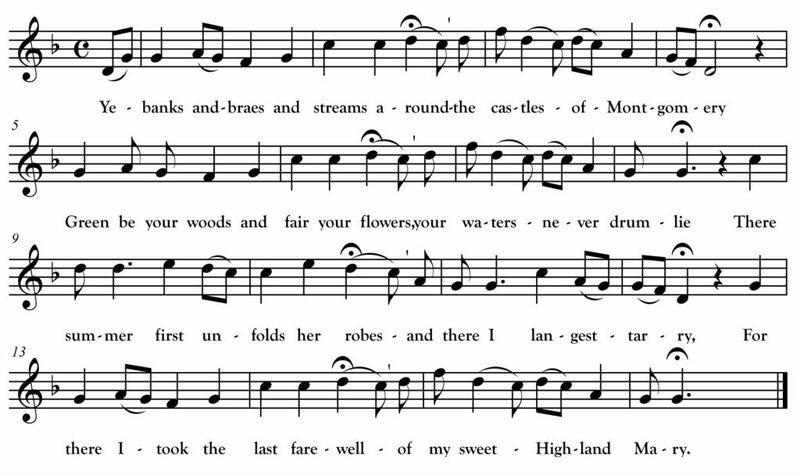 Now green’s the sod and cold’s the clay that wraps my Highland Mary. But still within my bosom’s core shall live my Highland Mary. Twelve years after Dominic Gallagher was recorded on Beaver Island, famed Co. Fermanagh singer Paddy Tunney assisted collector Peter Kennedy in recording Paddy’s mother Brigid Tunney singing a similar version of “Highland Mary” at her home in Fermanagh. Interestingly, Brigid, like Dominic’s father, was born in Donegal and her maiden name was also Gallagher. And tapped at the window where Katie did lie. “Arrah jewel,” says he, “are you sleeping or waking? Canadian folk song collector Helen Creighton recorded this song in 1948 from fisherman Amos Jollimore of Terence Bay, Nova Scotia. 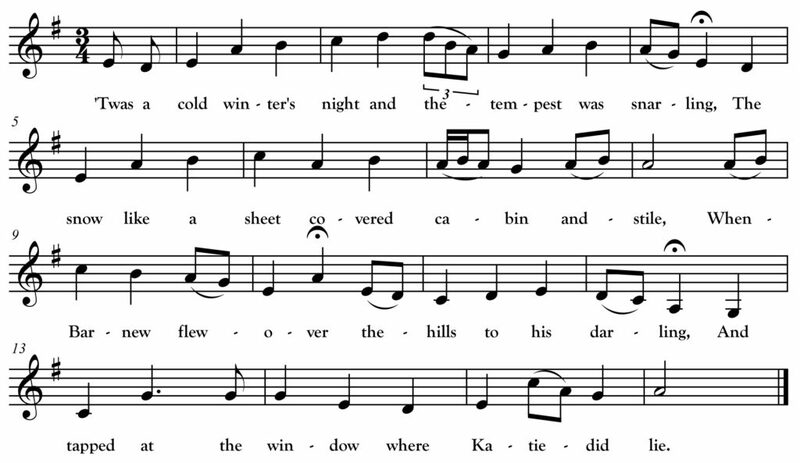 In addition to the Canadian Maritimes, it was sung in Ireland and New England and it even travelled west where versions were collected in Ohio and Utah. Tríona Ní Dhomhnaill recorded a version with the band Relativity in the 1980s. Though it begins like many other “night-visiting” songs, Katie’s good reputation and Barney’s threat to it play a bigger role in this story than most. His attempt at “Baby, It’s Cold Outside” is met with a well-reasoned plea for restraint and, in the end, no means no and Barney proves to be a respectful suitor. And she slyly told her mother, she loved young Cunningham. It’s “Hold your tongue, you silly fool! You grieve my heart full sore? I wrote about a Minnesota variant of this song, “The Roving Irishman,” in the August 2012 Northwoods Songs. Known in Ireland as “The Roving Journeyman” or “The Little Beggerman,” this version comes from northern New York State where it was sung by Ted Ashlaw. You can hear Robert Bethke’s recording of Ashlaw singing it here. Ashlaw learned it from the man who composed the variant: Charlie Cunningham. Cunningham reworked “The Roving Journeyman” to reference places in the northern Adirondacks he frequented and also to make some insinuations about his relationship with a local woman (“Tobin’s lovely daughter”). I recently had the honor of writing the foreword for a wonderful new book by folklorist Robert Bethke about singer Ted Ashlaw and his songs entitled One Rough Life, Ted Ashlaw: Adirondack Lumber Camp and Barroom Singer. The book comes with a 2 CDs of Bethke’s field recordings of Ashlaw—a great resource for northwoods songs!